CloudShare TeamLabs allows you to easily and seamlessly extend your development and QA labs to the Cloud, providing you with the labs you need, when you need, with the click of a mouse. Now, you can easily deploy your products on your CloudShare environments automatically using Microsoft Team Foundations Server (TFS – Microsoft’s ALM platform). 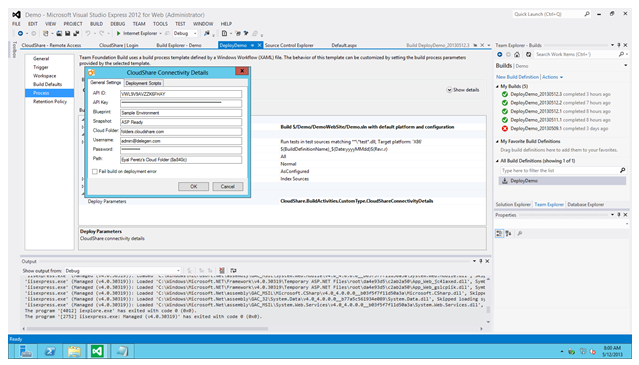 CloudShare provides a TFS build activity that enables deployment to CloudShare environments. The steps below describe the deployment process while using the build activity. Creating a new environment from a blueprint’s specific snapshot. Zipping your product output & uploading it to the environment cloud folders. Mounting your new environment to the cloud folders. (optional) Deleting your environment, since you can recreate it again from the snapshot just created. Readme.docx – describes how to install and use it. 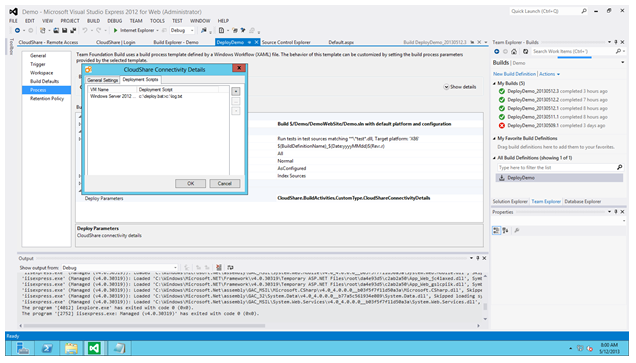 CloudShare.BuildActivities.dll – contains the build activity extension for your build. CloudShare.Template.11.xaml – extension of the default template provided by Microsoft to include CloudShare build steps. CSAPI.dll – CloudShare’s native .Net API. Installer –installation tool for the build schema and activity. You can download the TFS Plugin for CloudShare at http://go.cloudshare.com/TFSPlugin_Main.html?camp=TFS&term=Download&source=Blog&medium=Web. Disclaimer- this solution is designated for TFS 2012.